Swedes The Radio Dept. return after four long years with Clinging to a Scheme. Like their previous two albums and countless EPs of textural electronic-guitar pop, Scheme focuses on layers, atmosphere, minor chord moodiness and subtle rhythmic shifts. If you have yet to be exposed to the group — they’re not the most celebrated batch from the region — musically, fans of Belle & Sebastian, Camera Obscura and the entire Sarah Records catalog should find plenty to fall in love with. From the OMD-inspired pulse of “David” to the catchy and much blogged about “Heaven’s on Fire” the album serves as rainy day dream-pop for the brokenhearted while adding weight to their impressive catalog, and ammo for their cult following. “David” actually debuted last summer with its own EP while “Heaven’s on Fire” has been on nearly every bloggers playlist for the last couple of months. Those songs are the undeniable catchy standouts that will hopefully draw some new attention to the act. Other rewarding listens will stick with you for days, or serve as the lead-off number for that mix-tape you’re going to sheepishly give that special someone who “doesn’t get you” yet. There’s the rhythmically urgent “This Time Around“, “Never Follow Suit” is like a lost ‘Madchester’ jam on Codeine and the soaring “The Video Dept.” makes a case for self-parody in name but also acts as a tribute to their excellent 2004 single “Pulling Our Weight“. Singer/guitarist Johan Duncanson’s removed and disaffected voice is the anchor for all of these gems. Despite the fact he carries a tone that can melt your ice cream on the coldest day you’ll insist on calling this “pop” (see album opener “Domestic Scene“). 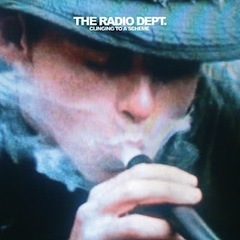 Posted on March 24, 2010 March 24, 2010 The Radio Dept. Year after year isn’t quite accurate is it? 🙂 I loved Lesser Matters and quite liked Pet Grief so I’ll definitely be giving this one a go. Very nice tune. I only heard of Radio Dept. a year or so ago, but they are fantastic! Thanks. Good point. I was referring to the fact that — with the exception of 2007, — they have released something every year. It’s typically an EP or single, but I see your point as they certainly don’t release full-length albums every year. Thanks.